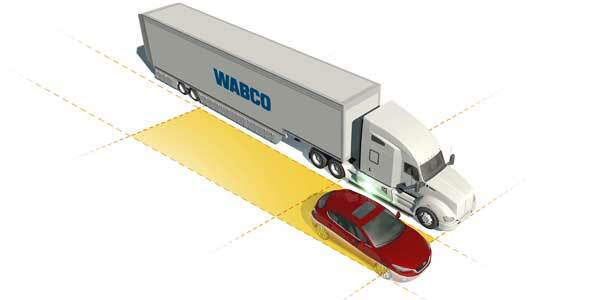 WABCO introduced the OnSide blind spot detection system for commercial trucks and trailers. The radar-based system alerts drivers of the presence of a moving vehicle in a truck’s blind spot and provides a side collision warning to reduce the risk of accidents. WABCO OnSide helps improve commercial vehicle safety by alerting drivers to the potential of a side collision with a vehicle traveling in a truck’s blind spot. The system uses advanced short range radar to detect a moving vehicle in the blind spot and then alerts the driver with a visual signal. When the truck’s turn signal is engaged, the system provides a more assertive warning in the form of an audible signal or a seat vibration. 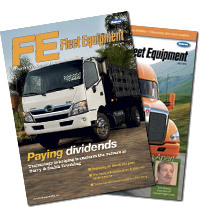 The Insurance Institute for Highway Safety reported that among the 97,000 annual large truck crashes involving intentional lane changes, side view assist technologies could prevent or mitigate nearly 39,000 crashes annually, including 2,000 that result in injury and 79 that cause fatalities. When used in conjunction with WABCO’s OnLaneAssist lane keeping assist system, OnSide has the capability to go beyond warning to enable active collision avoidance. In that case, if a lane change is initiated and OnSide detects a vehicle in the adjacent lane, OnLaneAssist applies a correction torque to the steering wheel to return the vehicle towards the lane center. WABCO’s lane keeping assist system also releases the torque as soon as the proper driving path is reestablished. OnSide’s radar sensor enables a 160-degree field of view and provides coverage for up to 65% of a standard 53-ft. trailer. According to WABCO, the system performs reliably even in low visibility conditions such as darkness, fog, rain or snow. In addition, WABCO OnSide distinguishes moving vehicles from objects that do not pose a hazard, thereby minimizing false warnings. OnSide can be mounted out of sight behind fairings on either side of the vehicle and features plug-and-play functionality that does not require alignment or calibration, the company explained. OnSide will be available as a retrofit kit in November 2017 and through major North American truck manufacturers in the first quarter of 2018.